If you want to get a bigger chest one of the best ways to do so is by learning how to tone your lower chest as opposed to working on another portion of this muscle group. Although you may not have heard this tip before it is very effective in bringing out definition in the chest area. 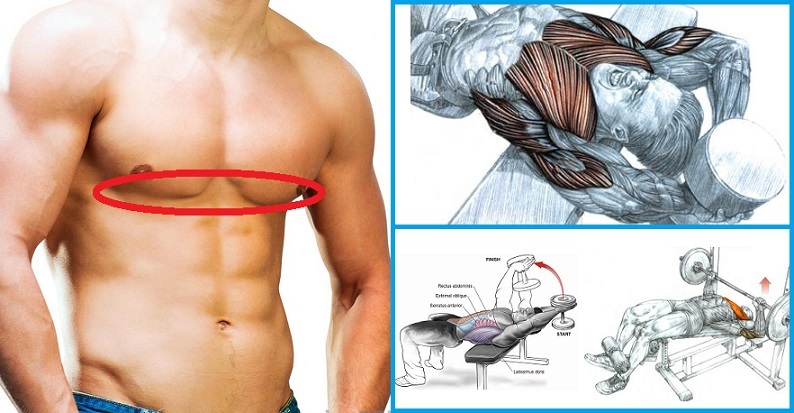 The chest muscle group is divided in the following manner: top chest, middle and lower chest. Often times guys focus on either the middle or sometimes the upper chest to bring out definition and develop it to its potential. In weightlifting there is a myth that working on the lower chest will create a “bottom heavy pecs.” The belief is that as more muscle is developed in the lower chest gravity will eventually cause the pecs to hang lower. I do not agree entirely with this belief if you are working the chest area properly. In order for the pecs to look their best they have to be exercised from each angle as mentioned earlier. Simply choose exercises that will target each area of the pecs. Because of the fear of getting bottom heavy pecs many guys will ignore the lower part of the pec area. Dips: Perform dips using your body weight. As you lower your body keep your chin tucked in and touching your upper chest. This tweak will force the lower chest to become more involved. Decline Bench Press: Use dumbbells or a barbell when performing this exercise. When bringing the weight down do not over stretch the muscle. For best results have the arms form a 90-degree angle at the lowest point. Simply adding these two exercises will help you tone your lower chest. Include these exercises along with exercises that target the middle and upper chest and you will have great definition in your pecs.